Two generations of Buckminster Fuller’s family will travel to Edwardsville to celebrate a “Bucky Weekend” honoring the visionary inventor’s legacy in the region. The Center for Spirituality and Sustainability is hosting an opening reception for its new Fuller Dome Gallery from 7-9 p.m. Friday, Nov. 9. The exhibition space is located inside the Buckminster Fuller-designed Fuller Dome on the campus of Southern Illinois University Edwardsville. Bucky Fuller’s daughter, Allegra Fuller Snyder, his granddaughter Alexandra May, and her husband Sam May will be in attendance. The opening reception will feature an exhibition of Buckminster Fuller’s art print portfolio entitled Inventions: Twelve Around One. The print portfolio was gifted to the Center for Spirituality and Sustainability in 2017 by the Estate of Buckminster Fuller, and was received into the SIUE University Museum collection in cooperation with the SIUE Foundation. 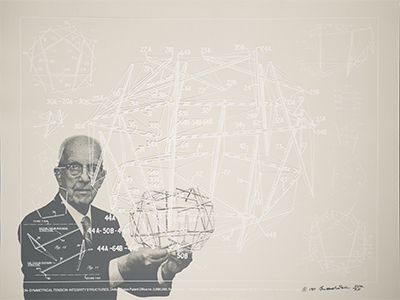 The important set of art prints, produced in 1981, features 13 of Buckminster Fuller’s most significant inventions presented as drawings, as well as duotone photographs. Future exhibitions in the Fuller Dome Gallery will be curated from the SIUE University Museum’s culturally significant collection of art and artifacts. The framing of the Fuller art prints and the creation of the Fuller Dome Gallery was made possible through a grant from the SIUE Meridian Society. The opening reception of the Fuller Dome Gallery is free and open to the public; however, a premium ticket is available for private events with Bucky’s family that include a VIP Preview of the exhibition and a Bucky-related architecture tour of the St Louis area. The tour begins from the SIUE Fuller Dome at 9 a.m. Saturday, Nov. 10, and will return to the SIUE Fuller Dome at 4 p.m. Premium tickets for Friday’s VIP Preview, which includes the bonus architectural tour on Saturday, are available at www.fullerdome.org. Buckminster Fuller was a professor at Southern Illinois University from 1960 to 1974. He designed the Fuller Dome for the SIUE campus with his architectural partner Shoji Sadao. The dome opened in 1971. The Center for Spirituality and Sustainability is a nonprofit multi-faith home for spirituality and sustainability efforts housed in the Buckminster Fuller Dome on the SIUE campus.